WASHINGTON -- After the 16-day government shutdown earlier this month produced devastating poll numbers for the GOP, Senate Minority Leader Mitch McConnell (R-Ky.) stated plainly that the Republican Party would not repeat the mistake. "A number of us were saying back in July that this strategy could not and would not work, and of course it didn't," McConnell said on CBS's "Face The Nation" on Sunday. "So there will not be another government shutdown. You can count on that." It remains to be seen whether McConnell can keep his word when the country hits its next predetermined political crisis deadline -- Jan. 15, when the continuing resolution funding the government expires and a new round of sequestration funding cuts are set to be implemented. The current system of campaign finance guarantees to make it difficult. 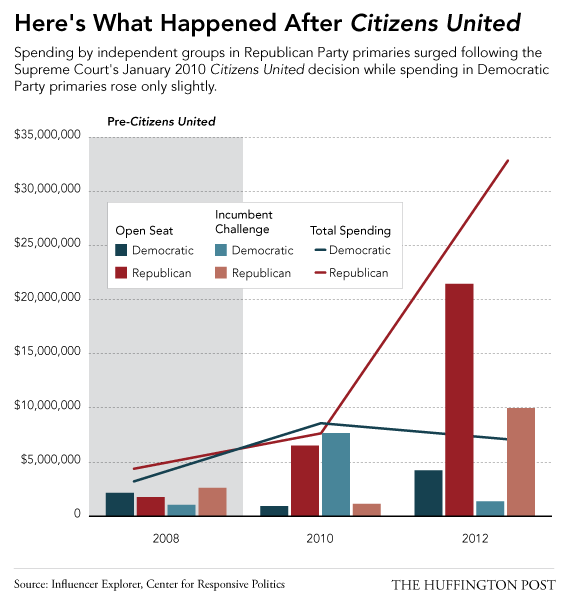 The unlimited outside money unleashed by the Supreme Court's 2010 Citizens United decision and the climate of never-ending fundraising for members of Congress have pushed both parties to seek money from their most partisan supporters, further empowering the right-wing insurgency inside the Republican Party. The decision let corporations, unions and, following a lower court's ruling, individuals give and spend unlimited sums on independent political activity. Groups like the Club for Growth, FreedomWorks, the Senate Conservatives Fund and Heritage Action for America are now much better positioned to lead the rightward shift in the GOP, increasing the likelihood that crises like last week's debt limit showdown will become perennial. The rise in unlimited spending by outside groups coincided with a loss of money for the traditional Republican Party structure after the enactment of the McCain-Feingold campaign finance reforms. Combined with the decentralization of media and messaging brought on by the Internet, it's the fuel for the GOP civil war. "Grassroots activists have an ability to self-organize, to fund candidates that they’re more interested in, going right around the Republican National Committee and the Senatorial Committee," FreedomWorks CEO Matt Kibbe said in a C-SPAN interview after denouncing the deal reached by Republicans and Democrats last week to open the government without touching Obamacare. "That's the new reality," Kibbe added. "Everything's more democratized and Republicans should come to terms with that." The organization of grassroots Republican voters has been underwritten by big checks from some of the wealthiest Americans in a long-term campaign to push the country and the Republican Party further to the right. But while most of the tea party-aligned insurgent groups do not lack for money, they still need to build supporters and make sure their issues are on the front burner in Washington. Manufactured crises like a government shutdown or threats to breach the debt limit are useful to gain attention and followers. The same goes for campaigns like Sen. Ted Cruz's (R-Texas) push to defund Obamacare, even when there is no chance of success. The Club for Growth's PAC, which acts as a conduit for contributions to its endorsed candidates, saw contributions in September come at a pace not seen since the tea party surge in 2009 and 2010. Senate Conservatives Fund attracted more than 2 million signatures to its defund Obamacare website over the summer and through September, helping to set back-to-back non-election year fundraising records of $1.5 million in August and $2.1 million in September. Nearly all of this money was raised from small-dollar donors. Research by Stanford University political science professor Adam Bonica has shown that small donors tend to give based on partisan appeals, or outrageous comments like the "You lie!" outburst from Rep. Joe Wilson (R-S.C.) during President Barack Obama's 2009 health care speech to Congress. The small donor partisan effect can also be seen in the fundraising pitches made by members of Congress and party committees. "When I send out a fundraising email talking about how bad the Republicans are it raises on average three times as much money as when I send out an email, a fundraising email, talking about how good I am or how good the work that I do is," Sen. Chris Murphy (D-Conn.) said in a speech at a conference hosted by the Yale Institution for Social and Policy Studies in May. It's not just the independent right-wing groups seeking to increase support and build fundraising bases for themselves and their endorsed candidates that benefit from dramatic confrontations. These crises also help fuel fundraising by the other side. As Republicans pushed Congress towards a government shutdown, the Democratic Congressional Campaign Committee was able to turn up the outrage meter in its emails -- and set a fundraising record for the month of September in a non-election year with huge support from small donors. "For us, it's sort of mostly watching what [House Republicans] are doing on the Hill and providing our supporters with an outlet to fight back and defeat these guys or give them a hard time for some of these crazy votes that they're taking in Congress," Brandon English, digital director for the DCCC, previously explained to The Huffington Post. The positive effect of the shutdown on campaign coffers and supporter lists for groups on both sides of the aisle practically ensures that these same groups will try to gin up support for another highly watched crisis moment. Rep. Tom Rooney (R-Fla.) put it succinctly in comments to Politico following the failure of the government shutdown to extract any concessions for Republicans: The winners, he said, were "the people that managed to raise a lot of money off this."